A recent report by Freedom House reveals the expanding repression by China in Tibet and East Turkestan [Xinjiang]. The publication highlights the tendency of China’s new leadership to silence dissenting voices, suppress anti-government protests and increase trials and prosecutions for ‘endangering state security’. Despite censorship and repression in these regions, resistance and calls for greater autonomy and freedom still persist. Prominent human rights organisation Freedom House has published its latest report on China, Tibet and Xinjiang and states that there is an increase in repression under the new leadership of Chinese President Xi Jinping. 'Freedom House' has released the report entitled 'The Politburo's Predicament' released on Tuesday [13 January 2015] - highlighting the huge resources that China concentrates on the subject of Tibet and Xinjiang. The report also shows strong suppression of anti-government protests, with statistics showing a dramatic increase in the number of trials and prosecutions for crimes of "endangering state security", with many of those punished believed to be Tibetans and Uighurs. "The suppression of anti-government protests and ethnic clashes in Tibet and Xinjiang beginning in 2008 and 2009 included new rounds of abductions, imprisonment, torture, and executions, in some instances affecting hundreds or thousands of people at a time," the U.S.-based rights group said. "Official statistics gathered by the Duihua Foundation illustrate a dramatic rise in the number of trials and indictments for "endangering state security" beginning in 2008, with many of those punished believed to be Tibetans and Uighurs." 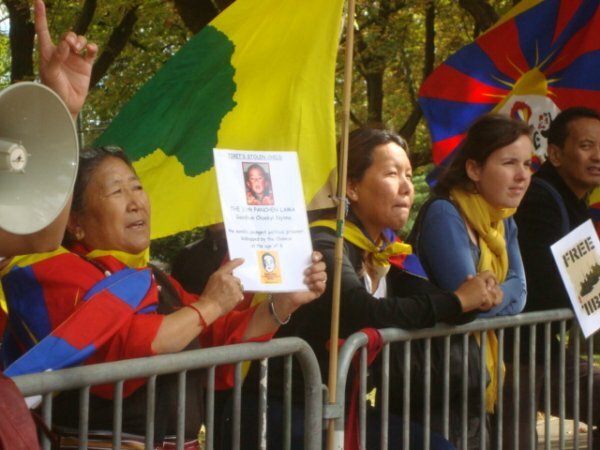 The report also noted the Chinese government's harsh response to the wave of Tibetan self-immolation protests that has swept Tibet since 2009. "As self-immolations reached their peak in November 2012 and then continued periodically, official reprisals for those involved intensified. In a form of collective punishment, a regulation allowed those found to have assisted a self-immolator to be charged with homicide," the report said. "A late 2013 crackdown in one county alone led to at least 58 detentions and 15 prison sentences of up to 18 years. At least two monks, including a popular religious leader, were beaten to death in custody in 2013 within weeks of their detention," the report added. "For persecuted religious and ethnic groups, the risks of even quiet resistance are significant given the harsh repression they face. Yet such resistance is widespread. Large numbers of Tibetans continue to keep an image of the Dalai Lama in their possession despite the threat of punishment and "patriotic education" campaigns that urge them to denounce their revered spiritual leader," the report said. "Among the topics targeted for censorship in China is a contingent of long-standing taboos, such as the writings of prominent dissidents, unfavourable coverage of CCP leaders, calls for greater autonomy in Tibet and Xinjiang, Taiwanese independence and democracy, and the Falun Gong spiritual group," the group said. The targeted content for censorship "also included are historic crimes—certain Mao-era atrocities and the June 4, 1989, massacre of protesters on and around Tienanmen Square—as well as more recent systematic rights abuses against dissidents and religious and ethnic minorities. The report said, adding that "the restrictions on both traditional media coverage and internet communications related to these topics have been well documented in a variety of academic and other studies." Previously the rights group independent watchdog organization dedicated to the expansion of freedom around the world produced a map of countries and their level of freedom. Tibet was amongst the world's 12 worst countries.